Today’s project is inspired by small treasures found in everyday life: notes that I find from the kids, around the house (like these), in pockets, and backpacks — notes between siblings, notes to me — to cousins and friends. I love every thing about them, right down to their often detailed envelopes. This watercolor resist project is one that can be done by all ages. I like the idea of experimental painting, creative expression combined with letter writing. I can’t show you all of the art created in this session but there’s something about multiple envelopes that seemed to beckon for more and more creating. to see the technique we used to make these watercolor resist envelopes. It’s so much fun. 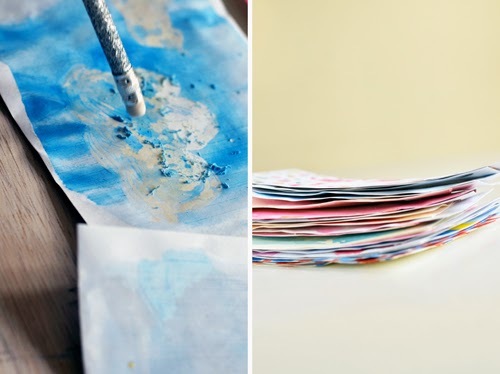 You can make cards or artwork using this technique, too. This is a great project to work with watercolor masking fluid for the first time. It’s a product that I was introduced to in art school, available at almost all art stores and really fun to work with. – Shake Watercolor Masking Fluid and apply pattern to paper. Let Masking Fluid completely dry. It is very important that this dries completely or it may affect the paper and paint. Once the masking paint has been applied, paint. – When the paint has dried, carefully remove the masking fluid with an eraser. – You can repeat this to make matching cards or use simple writing paper or cards with the envelopes. Would you love to receive an envelope like this in the mail, too. Happy Making! Above: We’ve used masking liquid for creative the above envelopes with the blank: label areas and white clouds. Process art vs product art. Painting with resist lends itself to both. – For toddlers, I often quickly jump to the idea of process art : splatting , sploshing or creating through expression or discovery. Depending on the ages of your children, you can have your kids both apply the mask (and then, letting it dry to do a 2 part series) or you can prepare for the project by applying the mask ahead of time and then, by setting up the project as a painting project; later experiencing the mystery of removing the mask together to reveal the final and new image with this mask area now blank. – If it’s possible to use the term: “functional process art” — I like the idea of applying a mask in the area of the label so that this area will remain blank so that you can use this as a label. – For children with strong fine motor skills, work on the art of incorporating the negative space created by the masking. Our oldest loves any time he can paint “Jackson Pollack-style” however, I’ve noticed that our daughter absolutely loves details and creating a small, detailed world. The exercise of working with this negative space is excellent for her and really captivates her imagination. My opinion is that art needs to be fun and that art is something for all ages. When the kids were toddlers, I could set up daily workshops, now, as they’re all elementary school aged, I still want to give them room to create — sometimes sharing the experience of creating with them — but, I do look for projects with flexibility. We need projects for kids with varying schedules and interests. What might draw in one of my 3 kids, won’t work for the other but, I like to quietly encourage imagination and creation. This project worked great for us because we could accommodate all 3 of their personal interests and skills. I hope you can tailor it to your own needs, too! I think it’s a wonderful way to mail Grandma a painting. It’s also a detailed way to add more expression to gift giving or letter writing. Wouldn’t you love to find a beautiful envelope in your mailbox or a card with an envelope with a story as a present topper? I’d love to see what you do and how you use this tutorial! After meeting Meri Cherry at AltSummit, I’ve enjoyed the fun of joining a few other creatives in making and sharing projects based on the same themes. For more resist art inspiration, check out what they’ve done, too!